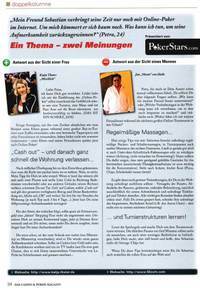 Today the first german poker magazine is for sale on shelves all across German-speaking countries. We had a printed version in our hand already on Monday when we had a meeting with editor in charge, Michael Dombrowsky. He proudly presented us the finished version which is very good. Much better and higher quality than expected. Well done Michael! This one will actually become a hit. So, if you can read any german, go out now and buy your copy! On other notes Tuesday I won that €200 NLH tournament in Schenefeld (field was small with 25 players only) because almost everybody is in Casino Bregenz for the tournaments there (sold out from what I hear). So some fierce competiors are not in town. Makes any difference, I don’t know. I usally bust out against weaker opponents – go figure. Anyway, it was nice to touch some money again, at least for 10 minutes when I sat down in the pot limit holdem game thereafter where I played three big pots, had the best all all three times the money went in but all three. Total loss is quite small (for that game) but still, it did eat most of my winnings. Poor feeling, as usual. That’s poker I guess (and greedy Jan who must play a pot limit game although tired from the long day and tournament and taking a seat with the two biggest luckboxes havin position on him. Well done.) On Wednesday I managed to get third in a €300 buyin NLH with 20 players and wisely skipped the pot limit cash thereafter (tired as hell). Katja was first out after 5 minutes when she got all her money in with QQ on a 5-5-8 flop but got called by 44 which made runner-runner flush. Poker is fun. I guess.